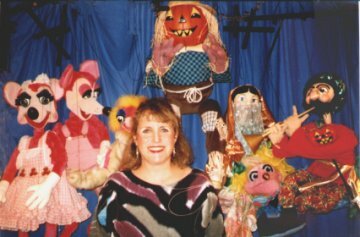 Susan Wall and Carousel Puppets have been delighting audiences for over 25 years. As artistic director, Susan creates all the puppets and oversees all aspects of the productions. Shows are available for all occasions: pre-schools, elementary school assemblies, libraries, parks, holiday and Christmas parties, corporate events, shopping malls, camps, company picnics, and birthday parties, just to name a few. Puppet making workshops are also available for children and adults. In the children's workshop, Susan guides the children in the making of a puppet of their own to take home. We can also provide goody bags for children to take home. We primarily serve the entire DC metropolitan area: Northern Virginia, Suburban Maryland and Washington, DC. In addition to pulling strings as a professional puppeteer, Susan Wall is also a trained actress and singer. Her stage presence captures the children's attention from the start as she puts on a musical puppet show that will thrill and delight audience members of all ages. Susan's puppet engagements have taken her throughout the U.S., Canada and the Caribbean. She has toured with Nicolo Marionettes and the world-famous Bil Baird Marionettes and has appeared off-Broadway in the Bil Baird production of Alice in Wonderland. Recently, Susan took a class at the University of Connecticut with world-renowned master puppeteer, Albrecht Roser, where she learned some advanced puppetry techniques. Clients of Carousel Puppets include Software AG, Accenture, McKinsey & Co, Pan American Health Organization, Everybody Wins, National Education Association, New York City Parks and Recreation, Loudoun County Parks and Recreation, Lucketts Fair, Burke Festival, Maryland National Capital Parks, Loudoun, Fairfax and Manassas Libraries, Dulles Town Center, Springfield Mall, Ballston Mall, Montgomery Mall, Miracle of Lights, and numerous other pre-schools, school assemblies, libraries, parks, and shopping malls all around Virginia, Maryland and Washington, DC. Carousel Puppets has also performed at many government facilities, such as the CIA, IRS, Library of Congress, and the Office of the President. Susan has held several offices, including President, of the Puppetry Guild of Greater New York. She is currently an officer of the National Capital Puppetry Guild and a member of the Puppeteers of America, UNIMA-USA, the Screen Actor's Guild (SAG) and Actor's Equity. Susan lives in Sterling Park, Virginia with her husband, their 17-year-old daughter, 13-year-old son and a few cats.